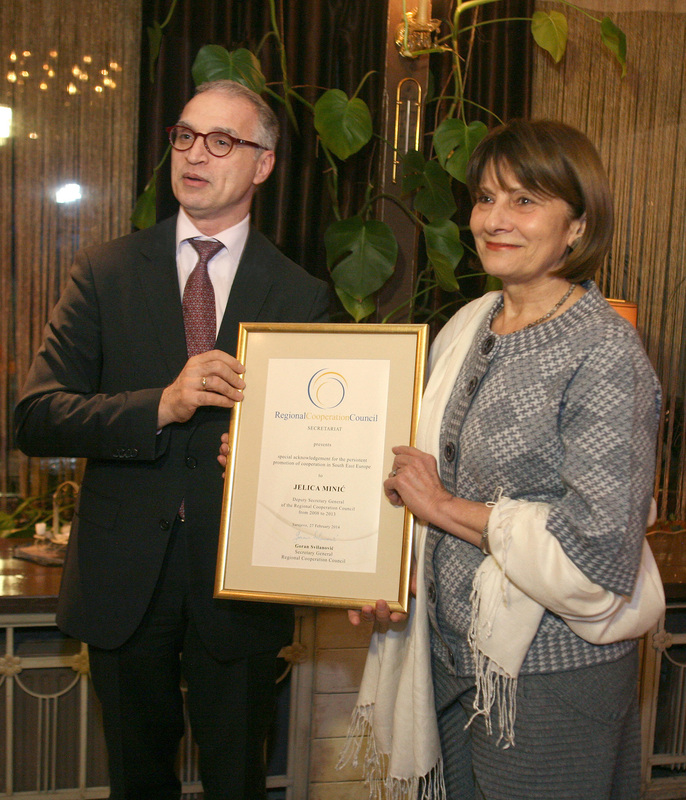 SARAJEVO – On the occasion of today’s sixth anniversary of the Regional Cooperation Council (RCC), the organization’s Secretary General Goran Svilanovic presented the South East European Centre for Entrepreneurial Learning (SEECEL) with the Champion of Regional Cooperation award for 2013. The award was handed to Efka Heder, SEECEL Director. “The SEECEL has been awarded for its active and dynamic approach to regional cooperation, its support to women entrepreneurs in South East Europe (SEE), and for its role of a dimension coordinator that will provide valuable contribution to the implementation of the smart growth pillar of the SEE 2020 strategy for growth and new jobs in the region”, said Svilanovic. “To be awarded the Champion of Regional Cooperation is really a tremendous honour for the SEECEL”, said Heder while accepting the award. The Champion of Regional Cooperation is an individual or an institution that the RCC Secretariat and its Secretary General consider has contributed the most to the development of regional cooperation in South East Europe over the course of the past year. The award has been presented for the second year in a row. The RCC Secretariat has also acknowledged Jelica Minic, former Deputy RCC Secretary General, for the persistent promotion of cooperation in South East Europe throughout her years with the organization and beyond. At the same time, the RCC Board held its first meeting in 2014, in Sarajevo. The Board members heard a report by the Secretary General on activities of the organization’s Secretariat in the period October-December 2013, as well as information on future plans. The report focuses on implementing the RCC Strategy and Work Programme 2014-2016 and its core element, the SEE 2020 strategy, prepared under RCC coordination, and adopted by the region’s ministers of economy in November 2013. The strategy aims at creating one million new jobs in the region by 2020, by concentrating on food and beverage processing, and tourism, as priority areas of cooperation. The Board was also informed about the 14th Coordination Meeting of the Troika (Romania as the current chair, Albania and The Former Yugoslav Republic of Macedonia) of the South-East European Cooperation Process, the RCC Secretariat and the European Union, held yesterday.